By Samiya Luthfia Khaleel, Lead Analyst, Clinical R&D, Beroe Inc.
Medical imaging plays an instrumental role in the clinical development of new life science products. Although the medical imaging industry is in a constant state of flux — due to increased investment in medical imaging companies, as well as mergers and acquisitions — adoption of novel imaging technologies to support clinical trials for the pharma, biotech, and medical device industries continues to increase. In fact, “centralized” imaging data is now used as a primary endpoint in many clinical research studies. This article will explore the factors driving imaging implementation in clinical trials, the current hurdles to increased adoption, and some of the technologies available to help overcome those challenges. This agency support has increased the adoption of imaging in clinical trials, and hence contributed to the growth of the imaging core laboratory services market. According to Markets and Markets, the global imaging clinical trial market size was $773.4 million in 2016 and is poised to grow at a CAGR of 6 to 8 percent between 2016 and 2020.4 The top five medical imaging service providers represent over 70% of the clinical trials imaging market. As a primary study endpoint: With the increasing costs and timelines for drug development, pharmaceutical companies are exploring innovative technologies that can bring new drugs to market sooner for unmet needs (e.g., orphan diseases). Using imaging as a primary, surrogate, and quantitative biomarker can accelerate clinical trials. However, forethought should be exercised during clinical trial study design when using imaging as an endpoint. In early-phase clinical trials: Imaging is a natural fit for early phase trials, since they are more dynamic and involve more scientific work than later-phase trials. Although early-phase trials typically present less logistical challenges, more imaging-intensive protocol and study structuring is involved. In late phase clinical trials: As a product moves through clinical trials, the imaging focus shifts toward efficient trial management streamlined operational workflow for easy regulatory approval. Imaging is a non-invasive tool that enables the study tissues that are difficult to sample through biopsy, such as lesions in cancer patients. It can also aid in the study of molecular-level disease scenarios and in prescribing targeted therapy (precision medicine), allowing screening and stratification of patients who are likely to respond to the tested therapeutic product and significantly reducing the overall study budget. It can reduce drug development time and accelerate regulatory approvals. The number of hospitals with access to the most advanced imaging technologies is limited in certain geographies, presenting site selection problems for multinational, multicenter studies. There has been some reluctance to adopt imaging as a biomarker, since it is sometimes perceived as an imprecise, qualitative method to arrive at drug efficacy conclusions. Lack of high-speed network connections at trial sites can hinder the quick transfer of images and lead to image latency. Network downtime can also be an issue, due to natural disasters and/or equipment/software malfunctions. Each trial is different, and there are very few software systems on the market that can effectively document the rationale for changes or modifications in clinical trials (audit trail) to meet 21 CFR Part 11 compliance. The complexities associated with physician reading or evaluation/assessment criteria used with respect to a therapeutic area may lead to inter- and intra-reader variability. Trial delays due to complex protocols involved in study set-up and revisions of project charter can sometimes call into question the usefulness of imaging as a primary endpoint in clinical trials. Spammers and other malicious code authors can launch distributed denial of service (DDoS) attacks on connected imaging systems, aggravating privacy concerns related to cloud computing. Adding imaging to clinical studies can add considerable cost. We will explore this last item further in a moment, reviewing the factors that contribute to an imaging-based study budget. Staff: A typical clinical trial requires a project manager, medical imaging technologist, biostatistician, radiologist, technical services manager, imaging scientist or physicist, and a clinical IT/software specialist. Approximately 50 to 60 percent of staff costs are attributable to radiologists. In some cases, imaging core labs have in-house radiologists, which increases their percentage of staff costs to 80 to 85 percent. Software tools: Some imaging core laboratories use in-house image data management systems for image upload, de-identification, data processing, and storage. They also use a variety of image analysis software/tools, both developed in-house and also in-licensed. Logistics: This staff is involved in site set-up, study site management, travel oversight, and image transfer (in film, CDs/DVD, and other formats), often from less technologically savvy investigator sites. Other: Also contributing to overhead are maintenance costs and, in some cases, rented facility costs. The chart below breaks down the imaging-related service costs for an example oncology drug trial involving 150 subjects and 429 total imaging visits (≤3 per subject) over two years. Using standardized protocols can prevent clinical trial delays and furnish quality images to regulatory authorities. The Quantitative Imaging Biomarkers Alliance (QIBA) protocol provides standardized methods and imaging procedures with uniform protocols that can be implemented to achieve accurate and reproducible quantitative endpoints in clinical trials, following Uniform Protocols in Clinical Trials (UPICT) conventions. These can be implemented across modalities, diseases stages, and anatomic sites.6 QIBA facilitates the use of imaging as a quantitative endpoint in clinical research and also gives proof of health status changes in patients to be easily accepted by regulatory authorities. AG Mednet’s platform has pattern recognition capability and anatomical QC at the site level, in addition to Digital Imaging and Communications in Medicine (DICOM) edit checks, electronic form edit checks, and admin QC checks (image checks and data de-identification). It also has the ability to assure that specified views (e.g., coronal, sagittal, axial) are present. A multitude of new technology patents have also been filed for improving image capture and reading/assessment. As pharmaceutical companies are eager to reduce development timelines, imaging core lab players are bringing proprietary technologies to the market as a means of saving sponsor costs and time. Labs have also been concentrating on particular therapeutic areas to become specialists in specific fields. 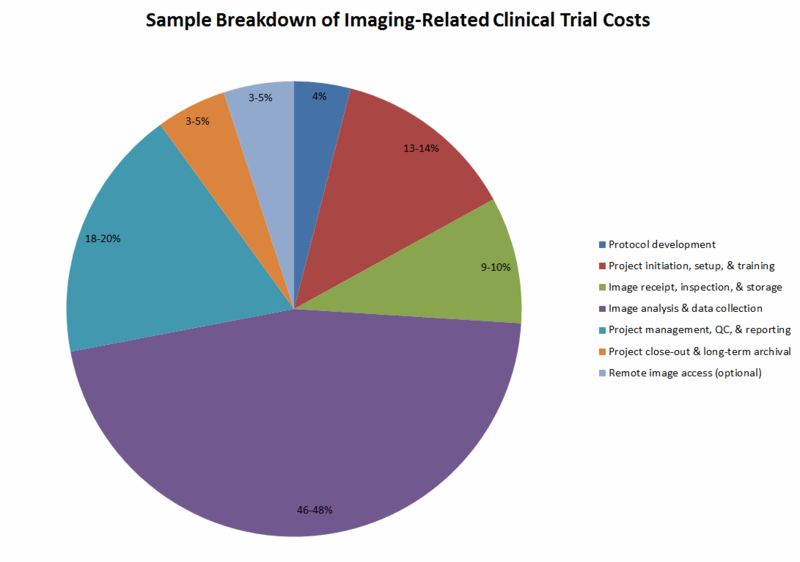 As discussed above, image analysis and data collection comprise 46 to 48 percent of overall imaging clinical trials cost. These costs can be dramatically reduced by implementing new technologies that enable physicians to spend less time analyzing images and that reduce the probability of errors occurring during image assessment. 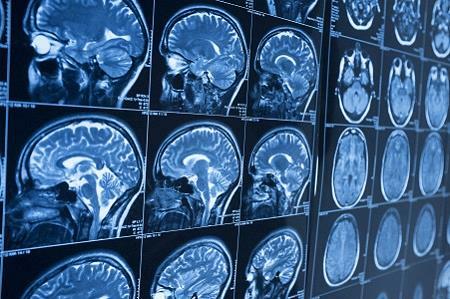 What’s Next for Medical Imaging Technology in Clinical Studies? Magnetic particle imaging (MPI) is a developmental imaging modality in which superparamagnetic nanoparticles of iron oxide are injected into the bloodstream and used as tracers. The nanoparticles are coated with different ligands that have affinity towards specific cells. Once they bind to cells, the nanoparticles emit signals enabling researchers to see the spatial distribution of drugs throughout the body, and also to view biological processes in real time. On the surface, imaging studies add cost to clinical trials. However, they can save sponsors considerable money in the long run by (A) helping identify patients most likely to benefit from the drug and (B) providing unique measures of the pharmacodynamic properties of drugs in the tumor microenvironment. These benefits enable imaging biomarkers to increase the probability of success in clinical trials and to evaluate efficacy more rapidly, thereby avoiding further investment in ineffective therapies and promoting therapies that might otherwise have been declared a failure. Samiya Luthfia Khaleel is a lead analyst for central and core lab services procurement at Beroe Inc. Her role involves regular interaction and networking with more than 100 clinical suppliers, and keeping track of market innovations related to the procurement of R&D services. Samiya completed her master's degree in biomedical sciences at Aston University (UK), conducting her thesis in asthma and chronic obstructive pulmonary disease treatments. She previously worked as a drug discovery scientist and industrial biotech engineer. You can contact her at samiya.khaleel@beroe-inc.com.